Before we look at how to record a macro, let's see first what recording is. Within your computer is a man called Bob (or a woman called Bobette, if you prefer). Bob is sitting with his pen poised, ready to write out the Visual Basic commands corresponding to everything you do in Excel (or Word). All you need to do is to press the Record button. So now we know what recording is - it's time to do it! To begin recording, click on the icon shown below (in Excel 2003 you can accomplish the same thing by selecting Tools -> Macro -> Record New Macro...). Here's how to fill in the 3 parts of the dialog box shown above. This method of naming things is called camel case, after the ups and downs of a camel's back. Under this naming convention, English would include words like LeapFrog, RollerCoaster, CupBoard and LifeStyle. Note that many people use underscore characters to make macro names more readable - for example, Copy_Scores_To_Results_Sheet. If you don't like your macro name, it's easy to change it when you've finished recording. You can assign an upper or lower case letter to run your macro, but I strongly recommend the former! Hold down the SHIFT key when typing a short-cut key into the box to insert an upper case letter. The reason is simple - many lower case letters are reserved. For example, many people use CTRL + R in Excel to copy cells to the right, and it will confuse people if this short-cut key runs your macro instead! 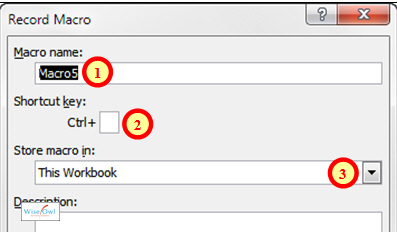 Personal macro workbook This will save your workbook in a special file called Personal.xlsm. The advantage of using this file is that Excel will automatically make its macros available to you whenever you have Excel open. This workbook This will store your macros within your current workbook (obviously). New workbook This will create a new workbook and record your macros into that. 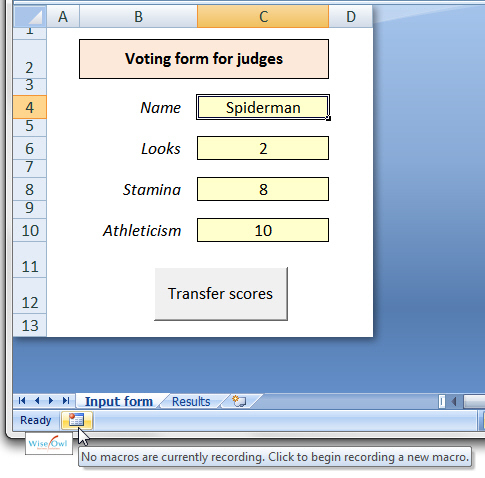 If you're new to Excel VBA macros, I'd recommend that you record into the personal macro workbook. Now that you've started recording, you can perform a series of actions in Excel, knowing that the long-suffering Bob inside your computer will transcribe each into VBA's macro language.